Using data from the SCIAMACHY instrument aboard ESA's environmental satellite Envisat, scientists have determined that the carbon monoxide hovering over Australia during the wildfire season largely originated from South American wildfires some 13 000 kilometres away. Using SCIAMACHY, Annemieke Gloudemans from SRON Netherlands Institute for Space Research and her colleagues at Utrecht University, the Vrije Universiteit Amsterdam and the Netherlands Meteorological Institute (KNMI) witnessed large quantities of released carbon monoxide (CO) above the southern continents. They also saw increased concentrations of carbon monoxide above Central Australia, a desert region that is not prone to forest fires. "Initially we assumed that the wildfires in North Australia were responsible for this. Yet when we took a closer look at the transport of carbon monoxide, we had to conclude that the majority originated from fires in South America. Even one-third of the carbon monoxide enhancements above the fires in North Australia originated from South America," Gloudemans said. Knowledge about the global distribution of carbon monoxide is important because it affects air quality and climate. SCIAMACHY is the first satellite instrument that can measure the global distribution of carbon monoxide with nearly equal sensitivity from the uppermost layer of the atmosphere down to the Earth surface where the carbon monoxide sources are located. "SCIAMACHY allows us to map the sources of carbon monoxide and see where they are blown to," Gloudemans added. "We did this for all of the continents in the southern hemisphere – South America, Australia and Southern Africa – for the years 2003 and 2004 and found surprising results. "It has been known for many years now that carbon monoxide from forest fires can be transported over long distances, but one would expect that the plume would rapidly become more diffuse the longer it travels. So, it was very surprising to find that even over Australian biomass-burning areas still up to 30% of the enhanced carbon monoxide levels from forest fires originate in South America." Forest fires in South America produced much more carbon monoxide in 2004 than in 2003, Gloudemans explained. "These levels correlated to the amounts found over Australia for the same periods, confirming that the carbon monoxide levels over Australia are severely influenced by South American forest fires." Plumes of carbon monoxide signal strong biomass burning. Apart from the carbon monoxide detected by SCIAMACHY, numerous other compounds are emitted that have severe consequences for air quality and climate. 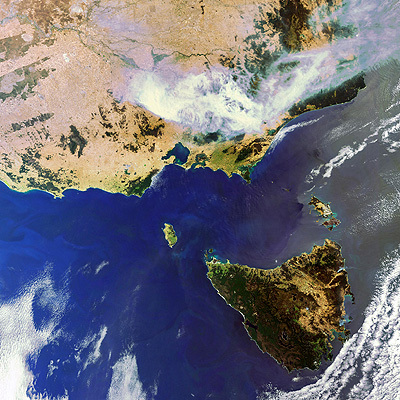 Depending on the aridity, much of Australia is prone to fires between October and March, and the direct consequences for humans and the environment are disastrous. The fire season in South America, often concentrated in Brazil, Argentina, Bolivia and Venezuela, lasts from July to December roughly and contributes up to 50% of the enhanced carbon monoxide levels in the atmosphere over Australia.